In this second part of our print ready brochure design, we will create the other side of our brochure. If the first brochure was about creating the outer side of the brochure, this one is about the Inner side. Let us start. 2. The next step is to flip the stripes. To do this simply select the stripes in the layers panel. Then press CTRL+T to transform all the stripes. 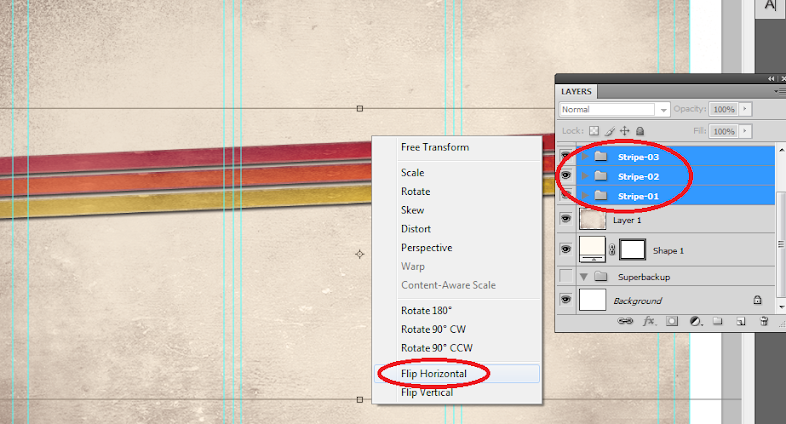 Right click on the transform box and choose “Flip Horizontal”. 3. After the flip, we then type in our Inner Content. Just use the type tool again to do this. Also keep in mind our security guidelines and panels. 4. For an added effect, we also added some bullet point graphics. TO do this, we just used the custom shape tool, and used an arrow as the bullet point. Just go to the custom shape tool options and find the right bullet point that you want for your own design. Just place it at the right place in your content and duplicate it as necessary. 5. Now, we will add a support graphic. First we insert an image of an old postcard. For our particular design, we used this:http://www.flickr.com/photos/playingwithpsp/2951476659/sizes/o/in/photostream/ We adjusted the pasted image a bit so that it looks brighter by going to the Image -> Brightness/Contrast controls. 6. Before we do anything else though, we will process our main image for the postcard. In a separate document we open up our brochure print file. In this example we are using this image from flickr (http://www.flickr.com/photos/55935853@N00/4498482498/sizes/l/in/photostream/) by Ewan-M. Then we add a sepia color effect. With the image active, go to Image -> Adjustments -> Photo Filter. Set the filter to Sepia and up the density value to 100%. 7. Next, we paste in our supporting image to our main brochure design. In this case, it is a corner store. We also change the size of our postcard texture image as well here to match our image a bit. 8. Now, change the blend mode of this picture layer to “Linear Burn”. This should help meld the picture better with our postcard paper texture. 9. Use the text tool to place in some text into the postcard as well. Remember that you can adjust the text size, spacing and other attributes using the character panel. Once you are sure about your text, rasterize it by right clicking on the layer and selecting “rasterize type”. 10. 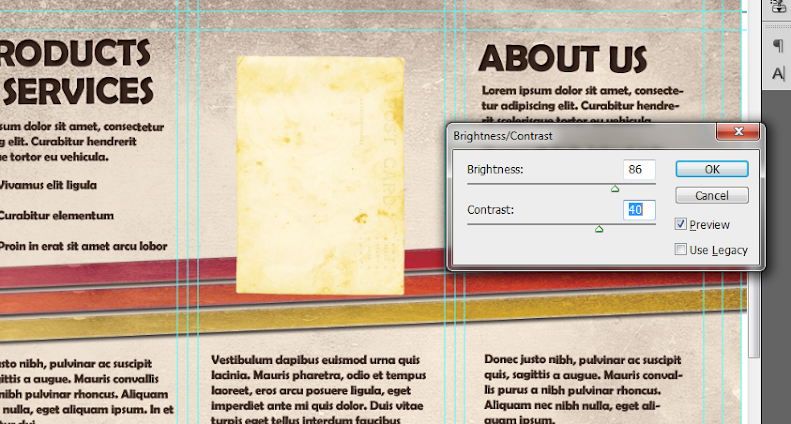 Now, merge the text, image and postcard into one layer. To do this, select all three layers and then right click on them. Once the context menu appears, look for the Item “Merge Layers” click on this to merge everything into one layer. Make sure of course that you do not want to edit any individual elements there before committing to the merge. 11. Then, with the merged postcard layer selected, go to Image -> Adjustments -> Hue/Saturation. Use the following values for this layer to make it look older. 12. Great! The next step is to add a picture shadow. To do this, we create a new layer just below our postcard layer. Then we hold the CTRL key to select the area of our merged image and text layer. Once you are satisfied with the selection, fill the area with a black color using the paint bucket tool. Then just nudge the layer by using the arrow keys 2-5 spaces down and 2-5 spacers to the right. 13. Now, with the black rectangle selected, go to Filter -> Blur Gaussian Blur. Use a 6 pixel setting for the radius to blur the shape out to look like a shadow. 14. Now, to make the shadow look better, rotate it just a bit. Do this by pressing CTRL+T and then just using the mouse over the edge of its transformation box, you can rotate the shadow to your specifications. We also reduced its opacity to about 65%. 15. Then, we select both the shadow and the postcard layer. Then we press CTRL+T to transform them. Rotate both elements just a bit to make our position just a tad more creative and natural. 16. Now, we create a new layer and place it on front of our postcard layer. We paint in some black grunge parts with the use of a grunge brush. We found some great grunge brushes from this generous guy here: http://hellostreetlight.blogspot.com/ If you do not want to make a mess with these brushes, it is good to select the area of the image and card area by CTRL clicking on their layer. Once you do this and select our new layer for the grunge, no brush effect will affect the rest of your card. 17. Then, just change the blend mode of the grunge brush layer to “Color Burn” to add them creatively to the postcard. Reduce the opacity as well to 62%. 18. With that, we have finished our Inner content design for our brochure. Take note that we have made a print ready design. So you will see the trim lines and the stripes of course go off the main design to help in printing and cutting. Just combine this with the first side what we created in the first part of the tutorial and you should already have a pretty print ready and creative color brochure design.